Jim Campbell has over forty years of experience as a catechist and national speaker in Catholic religious education and publishing. He received a bachelor’s degree and a master’s degree in European history and did his doctoral work in history. His life changed when he and his wife Barbara left their teaching positions to study at the Aquinas Institute of Theology, which was then located in Dubuque, Iowa. Barbara received a master of divinity degree from Aquinas, and would later receive a doctor of ministry from the University of St. Mary of the Lake in Mundelein, Illinois. Jim received a master’s degree in theology and a doctor of ministry in Christian education from Aquinas Institute. For eight years Jim was the director of the Orange Catechetical Institute, the adult education program for the Diocese of Orange, California. Jim also has been a Consultant in Religious Education for the Office of Catechesis for the Archdiocese of Chicago. 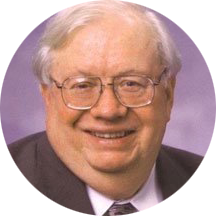 In the last twelve years before his retirement, Jim was staff theologian and Barbara was vice president for catechesis at Loyola Press in Chicago. In their years at Loyola Press Jim and Barbara were the authors of Finding God: Our Response to God’s Gifts, a Grade 1–8 religious education program inspired by Ignatian Spirituality that is now in its second edition. Jim is also the author of Stories of the Old Testament: A Catholic’s Guide, Mary and the Saints: Companions on the Journey (in English and Spanish), Serving the Catechetical Mission of the Church, The Third Millennium: A Catholic Perspective, and Every Man’s Journey: Becoming the Man God Intended. Every Man’s Journey, available through Dynamic Catholic, is a series of 30 meditations for men (or any disciple) inspired by the Apostle Peter. Jim and Barbara live in Rockford, Illinois, close to their six grandchildren. They still consult and speak in areas of Catholic religious education and spirituality.